Learn how to monitor your website using internetVista monitoring in less than 5 minutes! Monitoring your website should be easy and quick to set up. Follow the process below and get started in less than 5 minutes! A media is basically the way you want to be alerted when an error or an outage is detected within your website. When you signed-up for a free trial, the first media defined is the email address. If you don't have an account yet, you can always grab your free trial. How can I be alerted? How to add a new media? It's quite simple, just hover over the "Media tab" and hit "new media". From there, choose the channels via which you want to be alerted. If you share your account with a colleague who speaks another language to you, you can change it there. The timezone can also be adjusted in this section. An application is an element that you'd like to monitor. It could be an URL, a server or even a database. If you want to monitor your website for instance, the application would be an URL in this case (HTTP or HTTPS). How to monitor my website? Let's say that you're in charge of Amazon's website. You want to make sure that the users always have access to the website and don't have any trouble making purchases on your site. The first thing to monitor is the homepage because this is where 90% of your traffic comes from. Is your website in HTTP or HTTPS? If your website is in HTTP, please choose the tab accordingly. In our case, Amazon's homepage is secured (in HTTPS). Put a name on your application (Alias), copy-paste your website URL and choose the frequency. During your trial, you can check it every 5 to 60 minutes. Make sure you link your application to the medias in order to get the alerts and the performance reports. Don't know what to monitor? Always monitor the most important elements on your website. You could take the pages that generate the most traffic or even the ones with the most conversions. For an e-commerce website like Amazon, I'd probably monitor my top product pages (books, stores, DVDs, CDs, Smartphone) and the login page as shown here below. If you hold your website/blog in wordpress, make sure you download the internetVista plugin. Simulate and check if your contact or online forms are working properly. Monitor the user experience by simulating a multi-steps interaction on your website from a visitor point of view. Ex: User lands on the homepage, click on a product, add to cart and check out. We live in a digital era where consumers are more and more impatient and hate waiting. If you sell online, you know that timing is everything. 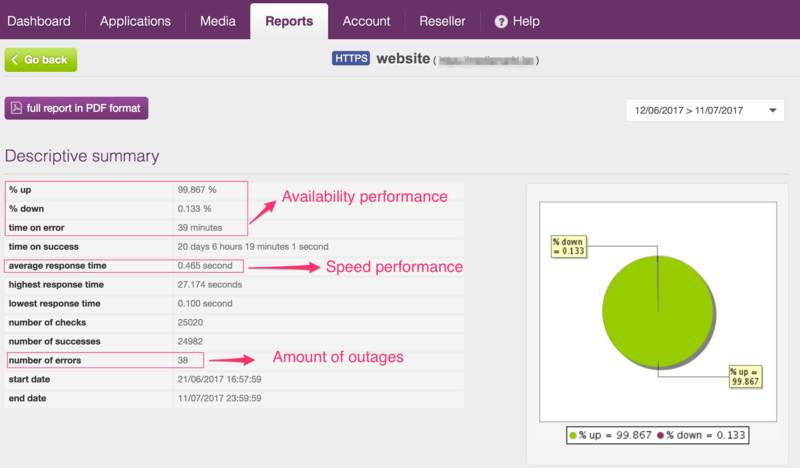 internetVista allows you to check and analyze your website performance. So, is your website fast and reliable? Let's find out! What KPIs should I look at? Where can I find the performance reports? How can I find the reports for a specific application? How can I export the report? You should check the uptime rate. The higher your rate, the better. An uptime of 100% would be ideal but we know that it is a very difficult goal to achieve. Ideally you should be above 99.8% per month. While uptime is critical, you also want to provide the best online experience to your users. To do that, you need to look at the response time indicator and discover how fast your website is loading. The ideal spot to website load time is 0.200 seconds but being under 0.500 seconds is still a very good performance. Do your users always have access to your website? That's basically the answer you get from the uptime rate, it tells you how reliable your website is. The response time indicator shows how much time your website takes to display the content. How many outages did your website face? internetVista lets you know the amount and the types of errors detected. 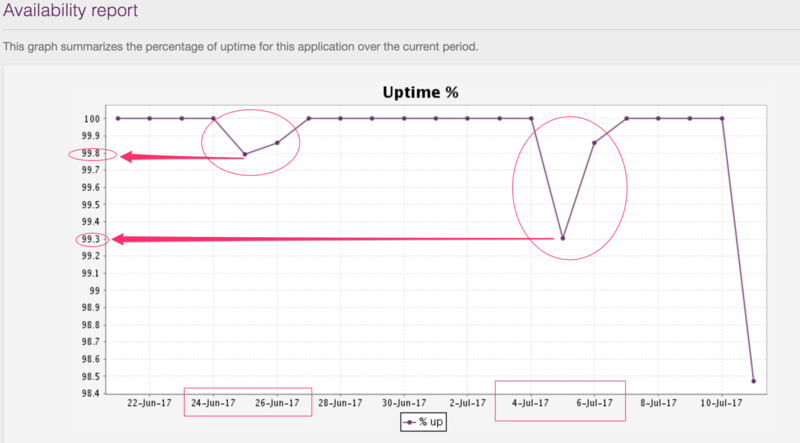 Discover when downtime happened and how it affected your website in terms of uptime. To visualize a sample report, click here. On the report tab, click on export. You can export in CSV, XML, PDF or RSS format. Improve the incidents communication by adding new users to your monitoring account. From this screen you can add, edit and manage the user privileges. Feel free to shoot us an email, the internetVista team will be thrilled to help you out! If your business is based on the internet, it is important and crucial to have a monitoring service. If your website is down, you lose money!